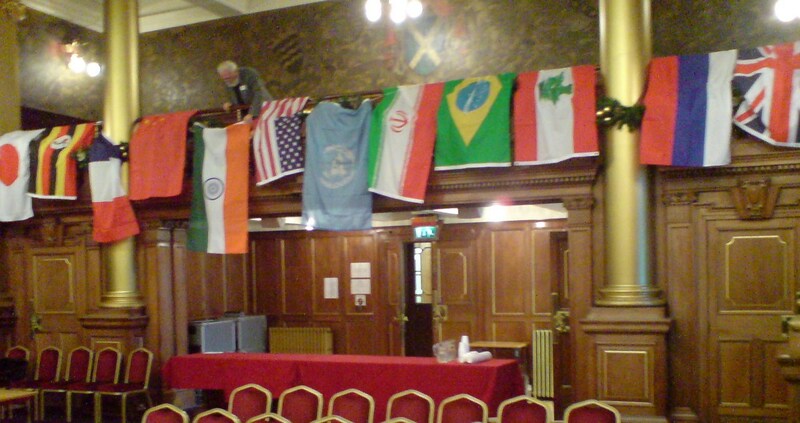 Over 100 high school pupils from the East of Scotland, their teachers and observers took part in the Model United Nations Conference at the Edinburgh City Chambers on 26 November 2010. Each of ten schools sent six pupil delegates to the Conference, each delegation representing a different member state of the United Nations. Each school submitted a variety of draft resolutions (28 in all) for debate. Most schools also sent a pupil as a “journalist”, to report back to their school on the day’s proceedings. The day was split into a Committee session in the morning, in which three United Nations Committees were modelled, and a General Assembly meeting in the afternoon. Councillor David Beckett, Vice-Convener of the City of Edinburgh’s Education, Children and Families Committee welcomed delegates to the Conference and Patrick Harvie MSP, Vice-Convener of the Scottish Parliament’s Cross Party Group on International Development gave the opening address. Two delegates from each school attended each of the three Committee Meetings. The Disarmament and Security Committee considered the question of policing nuclear non-proliferation. It debated whether or not countries should be allowed to keep nuclear weapons at all, whether action should be taken against states which secretly possess or develop nuclear weapons, whether the UN should control the supply of material used in domestic energy programmes and other issues. The Economic and Financial Committee looked at the world economic financial crisis and asked whether capitalism had run its course. It considered the need to control deficits, fair taxation systems, a greater role for the World Bank, the elimination of global trade barriers and a variety of other proposals. Human rights were debated by the Social, Humanitarian and Cultural Committee, which looked at whether ID cards, DNA records and IT surveillance were a violation of human rights. It considered the establishment of a UN DNA body to set up and store DNA information and issue guidelines; whether all countries should introduce National ID cards, subject to appropriate safeguards and whether IT surveillance should be used to defend and protect their citizens. The afternoon plenary session, which modelled the UN General Assembly, debated the environment and whether nuclear power was a viable alternative to fossil fuels. Most delegations endorsed the development of nuclear power, alongside other alternatives to fossil fuels, but were concerned at the possibility that states might use nuclear power development programmes as a cover for nuclear weapons development. The closing ceremony was conducted by the Convener of the Edinburgh Branch of the United Nations Association, Dr Gari Donn, who thanked all those who had taken part and awarded participation certificates to all the pupils. The conference seemed to have been well received. Pupils were somewhat diffident at first, but by lunchtime, delegates were lobbying each other in the corridors, and in the final plenary session, delegates were delivering confident speeches in the face of points of information and points of order. The standard of debate was excellent. In particular, pupils from George Watson’s College provided a sterling service in acting as chairs of the Committee meetings and of the General Assembly. The proceedings would not have worked without them. An informal meeting for teachers was held during the course of the day to discuss where things had worked well, where improvements could be made and possible ways forward. Unfortunately, arrangements for media coverage had not been made. In retrospect a press release to the Press Association a few days before the event might well have provided good publicity for the event and for the Association. The City of Edinburgh Council allowed us free use of the Council Chamber and other meeting rooms and their events team ensured the logistical success of the day. The staff of the Council were always on hand to help and they contributed greatly to the success of the conference. 1.The schools which took part were Dunbar Grammar School (E. Lothian), Earlston High School (Scottish Borders), George Watson’s College (Edinburgh), Inveralmond Community School (W. Lothian), Merchiston Castle School (Edinburgh), Penicuik High School (Midlothian), Preston Lodge High School (E. Lothian), St. David’s RC High School (Midlothian), St. George’s School for Girls (Edinburgh) and Wallace High School (Stirling). 2.The member states represented were Brazil, China, Russia, France, Iran, Japan, Russia, Uganda, the UK and the U.S.A.
3.The Disarmament and Security Committee, the Economic and Financial Committee, and the Social, Humanitarian and Cultural Committee.